We can thank Supervisor David Chiu for bringing Muni’s inadequate low-income pass down five dollars, and for saving much of the Transit Effectiveness Project from a total meltdown. Other than that, there isn’t much to celebrate from what happened last night at the Board of Supervisors. Chiu cut a deal that salvaged parts of the MTA’s awful budget, but it was the outcome of political extortion. 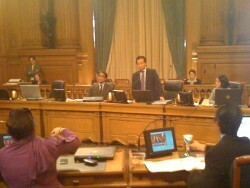 The Charter allows seven Supervisors to reject Muni’s budget, and for a while it looked like they would. But Mayor Gavin Newsom resorted to scare tactics, by saying rejection would blow a $30 million hole in the General Fund beyond the City’s mounting deficit. Chiu attempted to start negotiations last week to avert such a showdown, which the Mayor’s Office ignored until Monday night. By then, Supervisor Bevan Dufty had already backed off for fear of what Newsom would cut – which weakened the Board’s hand at the bargaining table. In the end, the real losers are Muni bus riders who struggle with a broken system. First, let’s talk about how the final outcome of Muni’s budget affects riders. Cash fares will still go up to $2, and Fast Pass increases to $55 and then $60 were left unchanged. The Senior, Disabled and Youth Passes will go up to $15 on July 1st – but these riders got a slight reprieve by postponing the hike to $20 from January to May 2010. The Lifeline Pass, which gives low-income riders a discount if they jump through enough hoops, will go down from $35 to $30. Making the Lifeline Pass cheaper is long overdue, and was not part of the MTA’s budget. But its price should be the same as other discount passes. Rather than proceed with an “up-or-down” vote to reject Muni’s budget, Board President David Chiu cut a deal with MTA chief Nat Ford and Supervisor Carmen Chu (who acted on behalf of the Mayor.) All in all, they took $10 million out of the MTA’s budget – and put in another $10 million. The wasteful “fare inspector” program was cut $2.5 million (out of $8 million), and Muni agreed to $4 million in delayed hirings. They didn’t restore expanded parking meters that had been removed, but Muni agreed to a “study” of where expanding it would be appropriate. And another $2.8 million were taken out of Muni’s infamous work orders – so that the MTA now only has to pay $63 million to other City agencies. Probably the best thing to come out of this agreement was to put $8.4 million back into bus lines – which effectively saves the Transit Effectiveness Project (TEP). The premise of the TEP was to scrap ineffective bus lines, and use the savings to add service on lines where it’s most needed. But the MTA’s proposed budget simply cut the lines that were planned – without adding new service elsewhere. The $8.4 million will add more buses on lines which the TEP had planned, but the plan had originally been to add $13 million. Still, what this does is salvage what would have been a complete betrayal of the TEP’s intentions. Was this deal an improvement over the MTA’s proposed budget? Yes, but only because their proposal was so bad. Still, I don’t blame David Chiu for working with the bad hand he was given. Chiu’s weak hand was the product of a petulant Mayor who does not respect our “checks and balances,” and who dragged this on until enough Supervisors blinked – out of fear. Last week, it became apparent that the Board of Supervisors had the seven votes needed to reject Muni’s budget – a right they explicitly have under the City Charter, even if it had never been exercised before. This power is the only “check” they have over the MTA Commission – all of whom are appointed by the Mayor. But at the Board’s Budget Committee, Controller Ben Rosenfield advised that there’s nothing in the Charter that requires the MTA Board to submit a new budget if the Supervisors reject it. If the MTA did nothing, the City would be required under the Charter to absorb Muni’s extra costs – burning a $30 million hole in the General Fund beyond its projected $500 million deficit. Of course, that is not the Supervisors’ fault. If the Muni budget was unfair, are they not doing their job by voting to reject it? But Mayor Newsom used this scenario to scare the Board into thinking about the ripple effect on budget cuts to health and human services – which is on everyone’s mind. Chiu attempted to avert this game of “chicken” when he asked MTA chief Nat Ford to “sharpen the pencils” – and make changes so that five (or more) Supervisors could vote for the budget. Chiu offered to facilitate such a deal, but he didn’t get a call back until the eve of yesterday’s Board meeting. Only then did they start a marathon session of negotiations in his office. At 2:00 p.m., Chiu asked his colleague to postpone the item – as talks with Ford, and Supervisor Carmen Chu (on behalf of the Mayor) were still going on. This left members of the public, the press and the nine other Supervisors waiting. Putting off talks until the day of the Board meeting was no accident. Newsom knew if he kept the doomsday scenarios about budget cuts going, “wavering” Supervisors would get nervous and buckle. Sophie Maxwell told one reporter yesterday (while everyone was waiting for the deal) that she hoped the matter could just be continued. But the Mayor’s Budget Office said they needed a decision now – because they needed to start preparing next year’s General Fund budget, with or without an extra $30 million hole in the deficit. By the day of the Board meeting, Newsom’s pressure tactics had worked. Bevan Dufty, who had voted in Committee to reject the Muni budget, said he would not be voting for it at the Full Board – for fear of other budget cuts. All the Supervisors are aware of Mayor Newsom’s petty and vindictive nature, and Dufty himself had been on the receiving end of such treatment in the past – for example, after he joined a veto override of police foot patrols. They knew how the Mayor is capable of reacting, and this fear guided their decision. Of course, Dufty flipping like that so publicly probably affected the negotiations. The Mayor now had the upper hand in cutting a deal with Chiu, because he knew Dufty – and probably Maxwell – would vote to sustain the MTA budget. Chiu may have been able to extract more concessions, if it appeared they were going to stand firm. In the end, Chiu probably got the best deal he could get – but it still leaves us with a bad Muni budget. And when details of the agreement were read at the Board meeting, progressives were not happy. Supervisors David Campos, Ross Mirkarimi and John Avalos all gave scathing speeches where they said they could not support a Muni budget. Chris Daly and Eric Mar likewise said they would vote “no.” Chiu had the unenviable task of breaking with his progressive colleagues, probably out of obligation because he brokered the deal. In the end, the Board voted 6-5 to table the motion to reject the MTA budget.